When I received an advance reading copy of “Tales From a Talking Board,” my dark little heart leapt for joy. I knew that upon turning this finely styled vessel over in my hands, that there were many portents held within. Lockhart, Ross E. (ed). Tales From a Talking Board. Petaluma: Word Horde, October 2017. This anthology contains a mélange of directives, a choir of voices that sing tidings of what many have seen as an introduction, a bridge for those occult and most macabre of vision-seekers: The Ouija Board. 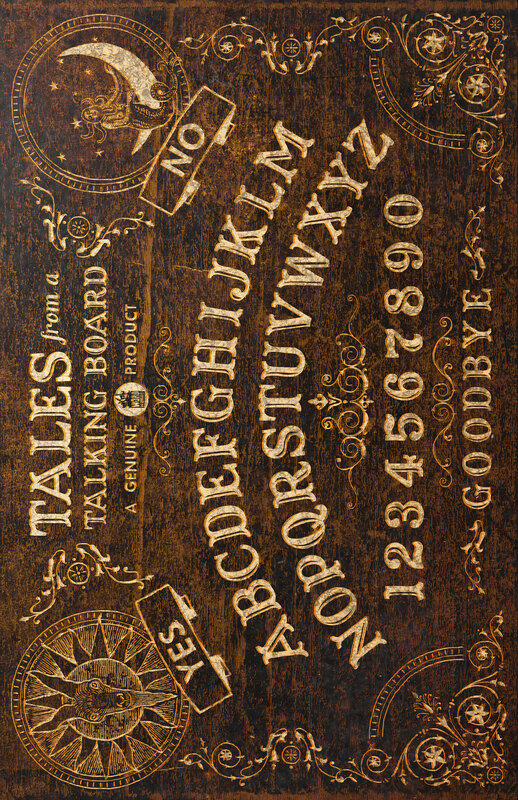 From the opening lines of this anthology we are brought through the history of the Ouija Board, and shown how it has gone from the craze of a nation, to its current sunken esteem, the relegation of a simple children’s toy. Isn’t that the way though, with technologies that were once considered new at one point in time? It seems that its novelty has worn thin over the decades, leaving us with the current fallen reputation of the Ouija Board. I have overheard hushed rumors that there may be a planchette bookmark with the final copy, which would add to the functionality of and punctuate this anthology as being no mere book. It might then become a bridge, for some. Over what vast gulf might this bridge span? Kristi DeMeester begins our journey with “YesNoGoodbye,” a tale of Cass and Dee. What multi-layered discoveries lie in wait for this pair? Then comes J.M. McDermott with “The Devil and the Bugle Boys.” A memento of the uncomfortable awkardness of some commitments we make throughout our lives. Anya Martin’s “Weegee, Weegee, Tell Me Do,” reeks of a nostalgic era of flappers and illicit alcohol. A lunar glow pierces all, over the faint crooning echoes of a neglected phonograph as it crackles and spits. Tiffany Scandal builds the pressure with “Grief.” Though we may not have been able to complete all of our relationships when we had the opportunity to do so, there are some questions that just don’t need to be asked. David James Keaton gains momentum with “Spin the Throttle.” Although we may want to party-hearty all of the time, there is always a price to be paid. S.P. Miskowski does not disappoint with “Pins,” which serves to emphasize that sometimes, we are all running from something, and we all have something to hide. Matthew M. Bartlett takes us for a fascinating detour with “Deep Into the Skin,” and advises us, premonitory of when we lift that veil to peer at what leprous sores may hide beneath the veneer of humanity. Wendy N. Wagner offers a high-octane exploit with “The Burnt Sugar Stench.” Some of us could never leave the sugar rush of our youth behind. Scott R. Jones maintains the cadence with “Worse Than Demons.” Not all questions want to be answered, anyway. Amber-Rose Reed. “The Empress and the Three of Swords” signify that sometimes, we are better off not knowing, and that with time, we will know soon enough. David Templeton’s “Questions and Answers” serves as a lighthearted stroll and welcome change of perspective that allows us another possibility as we seek to peek beneath those skirts of fate. But, we’ll have to try again, the response is hazy at this time. Again, an opportunity to hear from a point so far removed from my personal experience that the telling itself exhales a welcomed breath of lands far distant. May the cautionary tales enclosed within this tome serve as a reminder, and also a warning. Some answers should never be questioned, and some questions are best left unasked. I greatly anticipate the arrival of this beast to market.